Conan O'Brien hosted "The Tonight Show" for seven months. (Budget Travel) -- Conan O'Brien, the now former host of "The Tonight Show," needs to recharge his batteries and forget his battle with NBC. Here are some destinations the redheaded funnyman might like best. If Conan is sick of being the palest man alive, maybe a trip south is the answer. Way south, that is. There's perhaps no better place to reintroduce himself to the sun than Down Under -- from Bondi Beach to the Great Barrier Reef. Conan could use some of the $45 million he received from his separation agreement to fly his whole staff down with him. Fares to Australia haven't been this cheap in 5 years, so now's a great time to go. Conan seems to do well when he travels north. Not only has Canada's largest newspaper, The Globe and Mail, urged the national television broadcaster to hire the comedian, but he also once donned a Mountie uniform and spent a snowy day "assisting" the Canadian border patrol. While it may seem like an odd place for Conan to seek refuge, Finland's actually a place he's familiar with. Back in 2006, Conan visited the Nordic nation to meet his Finish doppelgänger, Tarja Halonen. Their shared likeness was made odder when one notices that Ms. Halonen is a) a woman, b) 14 inches shorter than Conan and c) the president of Finland. Overall, Conan found the Finns to be quite charming. He once told TV interviewers, "I've been around, and there are some countries where the ladies don't look too good. But, Finland. Mwah! It's incredible." 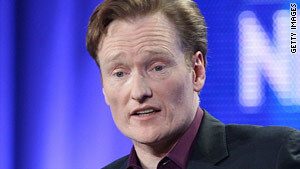 Conan's alter-ego, telenovela star Conando, could be hugely popular south of the border. (¿Conando? ¡Sí, Conando!) This is a perfect year to visit Mexico because the country will be celebrating its bicentennial with plenty of street parties. Conan could show off his marionette-like dance moves. The Dutch are considered to be the world's tallest people. At 6'4" (7'2" when you include his hair), Conan could easily blend in and enjoy some much-needed anonymity after weeks of intense media scrutiny. From Amsterdam, he could extend his vacation throughout Europe quickly and cheaply by train.